A common method for infection of many operating systems is a malicious executable file–either sent in an email or downloaded otherwise–that the user simply double clicks without thinking. Because most users are so used to the concept of double click to open they may not in fact realize that they could be executing arbitrary code (especially with a default setting to hide file extensions) or that arbitrary code even running with low permissions, can still be incredibly dangerous. A big selling point of security on many Linux or Unix systems is the distinction of Execute permissions. A downloaded file will not have the execute bit set. This means that, within a window manager, double-clicking will only attempt to read the file so the desktop system may ask what you want to do with it. Only by either explicitly telling this prompt to execute or by editing the permissions of the file from the command line can you execute this file. In either case this is an explicit action that the user must think about. However, many distributions of Linux use a standardized .desktop  file format. These files are often used as menu items or program launcher shortcuts: they have an Exec parameter that can take an arbitrary command string to run when clicked. Name=Write to an arbitrary file. Users and developers of these distributions have recently been arguing for re-evaluation of this specification for that very reason: they allow arbitrary code execution without the need for an executable bit set on the file. This opens up the same vulnerability in Linux systems that had previously been avoided. An inexperienced user used to double click to open might download a .desktop file and try to open it. Even a more experienced user might not realize this issue and (expecting the previously mentioned behavior of simply reading the contents of the file) click on it to see the contents. Even more troubling is the behavior of these Desktop files when used in the menuing system for many distributions: important system applications often have menu entries in /usr/share/applications. However, menu entries with the same name in ~/.local/share (the user’s local directory) with the same Name option will override the system one! A malicious script (perhaps even started by the exploit above) could shadow the desktop entry from one of the important system applications such as the Synaptic Package Manager. Users are used to typing their passwords at the gksu prompt when clicking on Synaptic so they would do so; now a malicious script has root access to the user’s machine. The biggest part of a solution to this problem would be requiring that .desktop files simply have execute permission set. On installation of a normal program this would be a trivial addition, but downloaded .desktop files would not be run. In case of some other malicious script gaining user access, normal users should not be able to override root owned .desktop files (like Synaptic). different distributions. It may take time for these changes to be made. Amazon’s S3 Outage: Usage spike or DDoS attack? By iddav at 10:50 pm on February 17, 2008Comments Off on Amazon’s S3 Outage: Usage spike or DDoS attack? Amazon’s Simple Storage Service (S3) experienced an outage on the morning of February 15th, causing inaccessible content in the thousands of websites that rely on S3 for data storage. According to Amazon’s official explanation, the outage was due to a significantly increased volume of authenticated calls from multiple users. From the security perspective, this leads to more questions than answers. Filed under: Availability,Current Events — Comments Off on Amazon’s S3 Outage: Usage spike or DDoS attack? Since ISPs, most notably Comcast, some time ago began identifying and purposefully destroying or severely throttling BitTorrent connections passing through their networks, the struggles on both sides of the fence have been nothing short of a game of cat and mouse. Home monitoring systems like Quiet Care exist to allow independent living for elderly people. The system works by monitoring the person’s daily movements with wireless activity sensors in each room. The information collected from these sensors is gathered at a communicator and then is sent to the Quiet Care server and is analyzed for patterns. If the server detects unusual behavior, it contacts the caregivers of the individual. As many of you may have heard, two undersea cables were cut on January 31st severing internet to millions of users in the middle east. At first it was reported that these cables were severed by a ship’s anchor, but it is now being confirmed that this is false. 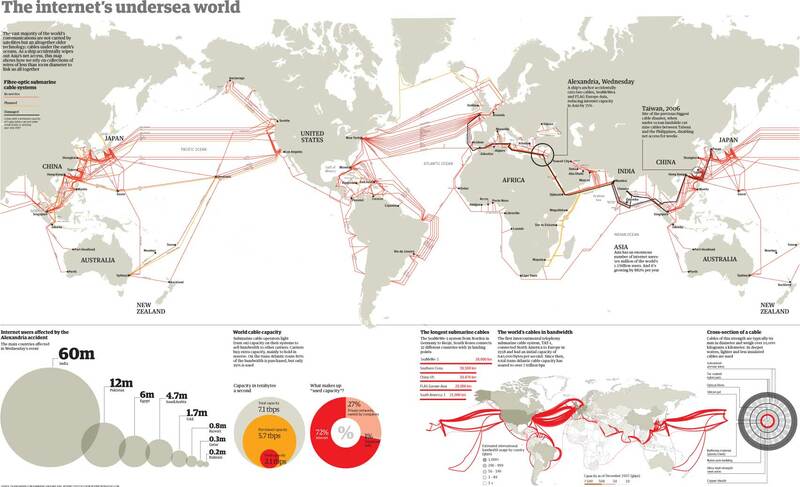 The map of undersea cables and those affected can be found here. However, in the last few days, two more cables have been cut. An illuminating internet traffic report is here. The probability of all of these events being random accidents seems vanishingly small. Could this be a new sort of attack intended to black out an entire region? If so – what could the motivations be and who could be behind this? Could this be done for commercial reasons? Could this be a government or terrorist organization about to mount an attack?